Last year, municipalities around the world had a tough task to clear a staggering 1.3 billion tons of solid waste. Such garbage, known as Municipal Solid Waste consists of paper, plastic, wood, glass and metal, among other items. According to World Bank, the world will generate over 2.2 billion tons of MSW by the year 2025. This is because of per capita wastage of material will rise from the current level of 1.3 kg per day to 1.42 kg daily. These figures do not consider waste from industries. Nor does it consider villages and settlements where organized waste collection does not exist. Everyone knows that waste products are a potential source of income. Rather, in every single aspect. Paper, plastic, rubber, wood, glass and metal, among other items can be sent for recycling. However, there is also a segment of this waste that can earn money for you in rare but conventional ways. Understandably, there are several rags-to-riches stories. These revolve around people who have found the proverbial goldmine in garbage. They did not set up expensive recycling factories. Nor did they open big businesses requiring huge investment and infrastructure. With some ingenuity, you too can earn best out of waste. The word ‘Phillumeny’ may sound alien to most of us. However, it is the word that describes an old and yet widely popular hobby of collecting different brands of matchboxes. In fact, it is an accepted form of hobby. Worldwide, there are several clubs where phillumenists- or matchbox collectors- meet. However, unlike collection of coins and stamps, phillumeny is fairly difficult to practice. There are several reasons for this. Of course, the main reason being the very vast matchbox industry that flourishes worldwide. The everyday matchbox is easy to manufacture. Therefore, it is made in almost every country that has any industry worth its salt. Consequently, most of these matchbox makers are small-time. Sometimes, they operate from home. Hence, no records of their existence are available. Indeed, the hobby is so vast, complete guides on phillumeny are available online. If you wish to get great with waste and help the community, consider phillumeny. You can begin at railway stations and bus terminus. Obviously, due to the vast number of people who go there. These people come from all parts of the country. Further, some of them throw empty matchboxes. Very often, these harmless and innocuous looking matchboxes will have come from unknown manufactures and will bear unheard of brands. Professional phillumenists pay well for such matchboxes. You can also auction them online. It all began as a soda fountain in downtown Atlanta in Georgia on May 8, 1886. John S. Pemberton made a formula that remains secret till today. The humble soda available only from Jacob’s Pharmacy gradually was named Coca Cola. Over the last 125 years, this drink became famous worldwide. Today Coca Cola is sold in almost every country in the world. Consequently, the largest ever soda has to be bottled at different locations in various countries across the globe. Today, Coke ranks as the highest consumed soft-drink in the world. Collecting Coca Cola or Coke bottles is a very major hobby worldwide. People across the world are always on look out for different types of Coke bottles. These include glass and PET bottles. In addition, collectors also look for writing of the brand Coca Cola in different languages. Coke bottles come in different shapes, sizes and shades. All these are needed by ardent Coca Cola bottle collectors. A guide on collecting Coca Cola bottles, complete with displays and loads of information is available on the company’s website. Coke bottles thrown as trash can earn you a mini fortune if you take a few pains to collect and preserve them. These bottles can be sold online. You can easily find empty Coke bottles at public places. The concept of cigarette cards began when tobacconists began putting a hard support to prevent their products from getting crushed easily. 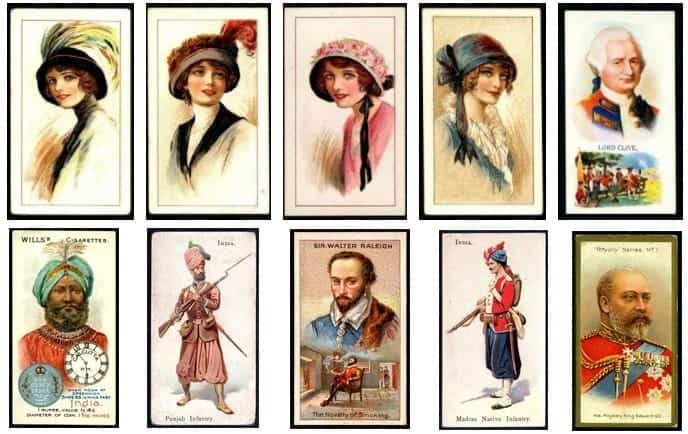 Over decades, cigarette cards began evolving into a major form of art. Subsequently, various things began to appear on cigarette cards. They include pictures of top sportsmen, political agenda, wartime precautions, images of movie stars and models plus lots more. Further, they also served as advertisements for a new or existing brand. Nowadays, cigarette companies use cards for various reasons. They print health warning or messages in public interest. Often, they advertise some special offer or promotion for the smoker. Some offer discounts on the next packet too. The system of printing pictures of various things continues. Generally, most smokers discard these cigarette cards unless they promise some big discount or cash reward. Here, it is worth remembering that cigarette cards are issued only once. The same company will never repeat a cigarette card. This makes them rare, adding to collector value. Consequently, collecting cigarette cards is now a major hobby and can net you a good income from aficionados. In most countries, your old newspaper would be end up in the nearest trashcan. Admittedly, old newspapers undergo recycling for making paper. Yet, people do not stack them since there are few takers. On the contrary, old newspapers become nuisance since they attract insects, fungus and dust. However, with some ingenuity and a small investment, you can build a small fortune with old newspapers and discarded notebooks, pads and motley other paper stuff. If you can invest in a good paper shredder, consider yourself in business. Shredded paper is nowadays in great demand. Paper shreds are put to good use by e-commerce companies to pack stuff customer orders. Remember, small amounts of paper shreds do not matter. You will need to churn out loads and loads of the stuff made by shredding all types of discarded paper. Specifications for paper shreds for packaging are available online. Alternatively, you can contact your nearest store who packs stuff for home delivery. It is worthy to note, paper shreds are in great demand since they are biodegradable waste and disposal is environment friendly. Restaurants rank as top culprits for wasting food, both, raw and cooked. Obviously, a lot of this wastage is not their fault. There is nothing a restaurant or anyone can do about food left uneaten by customers. Nor can they do anything about fruit and vegetable scrapings, bread crusts trimmed while making sandwiches, chicken skin, egg shells and old meat. However, you can mint money with these things. The demand for organic fertilizers, mainly called compost, is on the upswing. The demand is from commercial and home users of fertilizers. Moreover, everyone nowadays wants to go green and environment friendly. Setting up a food composting unit in your backyard is very cheap and requires minimal training. You can collect such trash from restaurants. Indeed, restaurants will also pay you to take the stuff away. After some sorting, the stuff can be put in a composter for a few days. Meanwhile, advertise for your compost. You will find a lot more takers than you could imagine. However, composters tend to emit foul odor. Be ready to deal with nasty smell in your backyard. So this way you can do the best out of waste and make some great income. I did like to sell trash(garbage for cash). I found it good to me to start earning money online.But how will I get the money and after how long? I WANT MORE INFORMATION ABOUT INCOME WITH RECYCLE.